To celebrate this year’s DEW Tour, in Long Beach, California, we’ll be premiering our documentary on the Brazilian “gift to skateboarding” and WE ARE BLOOD breakout star Tiago Lemos. Made possible by BLVD Skateboards, we’re giving away two BLVD Tiago Lemos Pro model decks to celebrate the documentary’s premiere. 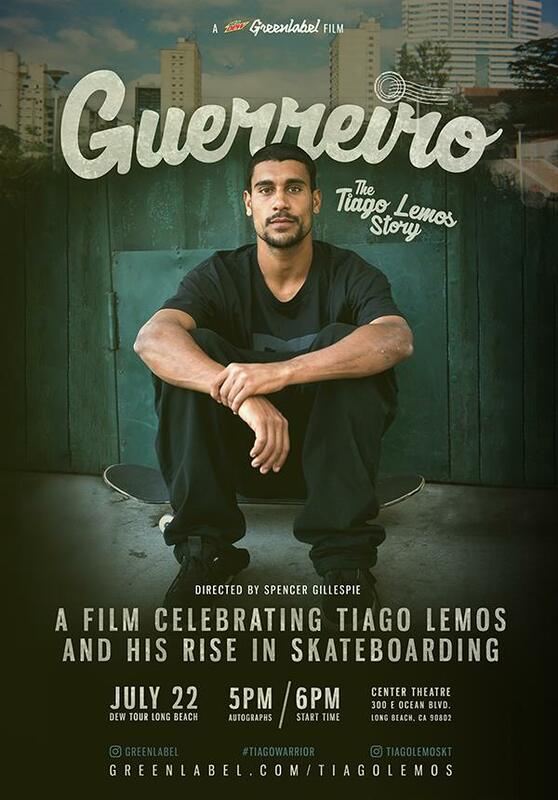 For a chance to win one of the decks, share the official trailer for Guerreiro: The Tiago Lemos Story (below) along with the hashtags #TiagoWarriorGiveaway and #GLSweeps on Twitter or Facebook. Winners will be selected at random, but multiple entries will be disqualified. The second deck will be awarded to a random attendee at the premiere of Guerreiro: The Tiago Lemos Story at DEW Tour. Event details can be found below. NO PURCHASE OR PAYMENT NECESSARY TO ENTER OR WIN. MAKING A PURCHASE WILL NOT INCREASE YOUR CHANCES OF WINNING. VOID WHERE PROHIBITED. Tiago Lemos Skate Deck Giveaway Sweepstakes (the “Giveaway”) is sponsored by Complex Media, Inc., having an address at 1271 Avenue of the Americas, 35th Floor, New York, NY 10020 (“Sponsor”). Subject to these Official Rules, the Giveaway is open only to permanent legal U.S. residents physically residing in the fifty (50) United States of America and the District of Columbia, who are at least 18 years old as of the date of entry and who have a Twitter and Facebook account in good standing by Twitter’s and Facebook’s determination. Employees of Sponsor and their respective parents, affiliates, subsidiaries, and advertising and promotion agencies and any other entity involved in the development or administration of the Giveaway (collectively, the “Giveaway Entities”), and their immediate family members or household members are not eligible to participate in or win the Giveaway. Participation in the Giveaway constitutes entrant’s full and unconditional agreement to these Official Rules. Winning a prize is contingent upon fulfilling all requirements set forth herein. THE GIVEAWAY IS VOID WHERE PROHIBITED OR RESTRICTED BY LAW OR WHERE BONDING, REGISTRATION, OR OTHER REQUIREMENTS WOULD BE REQUIRED BUT HAVE NOT BEEN MET, OR WHERE THE METHODS OF ENTRY SET FORTH BELOW WOULD BE DEEMED CONSIDERATION. ALL APPLICABLE FEDERAL, STATE AND LOCAL LAWS APPLY. The Giveaway begins at approximately 12:01 AM Eastern Standard Time (“EST”) on July 16 2014, and ends at 11:59 PM EST on July 22, 2016 (“Entry Period”). No purchase or payment is necessary to participate in the Giveaway. During the Entry Period, enter the Giveaway by posting on entrants Facebook or Twitter account the “Guerreiro” trailer and using the following hashtags: #TiagoWarriorGiveaway and #GLSweeps. There is a limit of one entry per Twitter and Facebook account/e-mail address. Multiple entrants that submit the same entry will be disqualified. Any late, lost, misdirected, incorrect or incomplete entries will be disqualified and Sponsor and its agents will not be responsible for such entries. Sponsor expressly reserves the right to disqualify any entries that it believes in good faith are generated by an automated means or scripts. Entries generated by script, macro or other automated means are void. One (1) prizes will be awarded, consisting of an exclusive BLVD skate deck (“Prize”); approximate retail value of Prize $50.00 USD. In no event shall the Sponsor be obligated to award any prizes other than the Prize specified in these Official Rules. The Prize is non-transferable and no substitutions (including, without limitation, for cash) are permitted, except that Sponsor reserves the right to substitute a prize of equal or greater monetary value for the Prize if such Prize should become unavailable for any reason. Each Winner shall be responsible and liable for all federal, state and local taxes on the value of his or her Prize, and any related shipping and handling charges. The Giveaway Entities are not responsible for failed, partial or garbled computer transmissions, or for technical failures of any kind, including but not limited to electronic malfunction or damage of any network, hardware or software and for typographical or other errors in the offer or administration of the Giveaway, including but not limited to: human errors, errors in the advertising, these Official Rules, selection and announcement of the Winner and distribution of the Prize. Sponsor shall be solely responsible for Prize fulfillment. If due to a printing, production or other error, more Prizes are claimed than are intended to be awarded for any Prize per the above, the intended Prizes will be awarded in a random drawing from among all verified and validated prize claims received. In no event will more than the stated number of Prizes be awarded. THE PRIZE IS AWARDED “AS IS” AND SPONSOR DOES NOT MAKE ANY, AND HEREBY DISCLAIMS ANY AND ALL, REPRESENTATIONS AND WARRANTIES OF ANY KIND REGARDING THE PRIZE(S). One (1) winner (each a “Winner”) will be chosen by the Sponsor at random on or about July 22, 2016 from all eligible entries received during the Entry Period. The number of eligible entries received determines the odds of winning. In the event of a dispute regarding the identity of a potential winner, the potential winner will be deemed to be the person in whose name the email address supplied in the corresponding entry is registered. The Giveaway will be conducted under the supervision of the Sponsor. The decisions of the Sponsor are final and binding in all matters relating to the Giveaway. Each Winner must claim his/her Prize within five (5) business days after the date of notification of such Prize. A winner’s failure to respond to the Prize notification within the specified five (5) business days will be considered such winner’s forfeiture of the Prize and an alternate winner may be selected from the pool of eligible entries. If an entrant is found to be ineligible, an alternate winner may also be selected from the pool of eligible entries. By entering the Giveaway or accepting a Prize, you agree to conform to all federal, state and local laws and regulations. When applicable, Winner may be required to execute and return (and winning may be conditioned upon the winner executing and returning) to Sponsor, within ten (10) business days, an Affidavit of Eligibility and a Liability and Publicity Release drafted by Sponsor to be eligible for the Prize, or an alternate winner will be selected. Winner may be required in Sponsor’s sole discretion to complete relevant tax forms as a condition to the delivery of the applicable prize. Winner may also be required to furnish proof of identity, address and birth date in order to receive a Prize. Unless prohibited by applicable law, your acceptance of a Prize constitutes your permission to use your name, photograph, likeness, voice, address (city and state) and testimonials in any and all media, in perpetuity, in any manner Sponsor deems appropriate for publicity purposes without any compensation to such entrant or any review or approval rights, notifications, or permissions; and constitutes your consent to disclose your personally identifiable information to third parties (including, without limitation, placing the winner’s name on a winner’s list). NOTWITHSTANDING ANYTHING ELSE HEREIN OR OTHERWISE, GIVEAWAY ENTITIES AND/OR THEIR VENDORS SHALL NOT BE LIABLE OR OBLIGATED WITH RESPECT TO ANY SUBJECT MATTER OF THIS AGREEMENT OR UNDER CONTRACT, NEGLIGENCE, STRICT LIABILITY OR OTHER LEGAL OR EQUITABLE THEORY FOR (A) ANY PERSONAL INJURIES OR SPECIAL, INCIDENTAL, CONSEQUENTIAL, OR EXEMPLARY DAMAGES (INCLUDING, WITHOUT LIMITATION, LOSS OF REVENUE, GOODWILL, OR ANTICIPATED PROFITS), (B) DATA LOSS OR COST OF PROCUREMENT OF SUBSTITUTE GOODS OR SERVICES, (C) ANY MATTER BEYOND SUCH PARTIES’ REASONABLE CONTROL AND/OR ANY MONETARY AMOUNT IN EXCESS OF THE ESTIMATED RETAIL VALUE OF THE PRIZE. By entering the Giveaway, you agree to and hereby do indemnify, release, and hold harmless the Giveaway Entities and their directors, officers, employees, attorneys, agents, and representatives from any damage, injury, death, loss, claim, action, demand, or other liability (collectively, “Claims”) that may arise from your acceptance, possession and/or use of any Prize or your participation in the Giveaway, or from any misuse or malfunction of any Prize awarded, regardless of whether such Claims, or knowledge of the facts constituting such Claims, exist at the time of entry or arise at any time thereafter. Any person attempting to defraud the Giveaway Entities or in any way tamper with the Giveaway may be prosecuted to the full extent of the law. Sponsor reserves the right to modify these Official Rules in any way or at any time. Sponsor reserves the right, in its sole discretion, to cancel or suspend the Giveaway should viruses, bugs or other causes beyond its control corrupt the administration, security or proper operation of the Giveaway. In the event of cancellation or suspension, Sponsor shall promptly post a notice on Sponsor’s website to such effect. The Giveaway shall be governed by New York law, without regard to conflicts of laws provisions. By participating in the Giveaway, you agree that any dispute or litigation arising from or relating to the Giveaway shall be determined by binding arbitration only in New York, NY, by and under the Streamlined Arbitration Rules and Procedures of JAMS, and judgment on the award rendered by the arbitrator(s) may be entered in any court having jurisdiction thereof. Notwithstanding the foregoing, Sponsor may seek equitable relief in any court of competent jurisdiction. If any provision of these Official Rules is held to be illegal or unenforceable, such provision shall be limited or eliminated to the minimum extent necessary so that these Official Rules otherwise remain in full force and effect and enforceable. To receive a complete list of winners or a copy of the Official Rules, within six (6) months after the end of the Entry Period, send a self-addressed stamped envelope to TIAGO LEMOS SKATE DECK Giveaway Sweepstakes Winner’s List, Complex Media, Inc., 1271 Avenue of the Americas, 35th Floor, New York, NY 10020. NO PURCHASE OR PAYMENT NECESSARY TO ENTER OR WIN. MAKING A PURCHASE WILL NOT INCREASE YOUR CHANCES OF WINNING. VOID WHERE PROHIBITED. “Guerreiro: The Tiago Lemos Story” Premiere Skate Deck Giveaway Sweepstakes (the “Giveaway”) is sponsored by Complex Media, Inc., having an address at 1271 Avenue of the Americas, 35th Floor, New York, NY 10020 (“Sponsor”). Subject to these Official Rules, the Giveaway is open only to permanent legal U.S. residents physically residing in the fifty (50) United States of America and the District of Columbia, who are at least 18 years old as of the date of entry and who attend the July 22, 2016 premiere of “Guerreiro: The Tiago Lemos Story”. Employees of Sponsor and their respective parents, affiliates, subsidiaries, and advertising and promotion agencies and any other entity involved in the development or administration of the Giveaway (collectively, the “Giveaway Entities”), and their immediate family members or household members are not eligible to participate in or win the Giveaway. Participation in the Giveaway constitutes entrant’s full and unconditional agreement to these Official Rules. Winning a prize is contingent upon fulfilling all requirements set forth herein. THE GIVEAWAY IS VOID WHERE PROHIBITED OR RESTRICTED BY LAW OR WHERE BONDING, REGISTRATION, OR OTHER REQUIREMENTS WOULD BE REQUIRED BUT HAVE NOT BEEN MET, OR WHERE THE METHODS OF ENTRY SET FORTH BELOW WOULD BE DEEMED CONSIDERATION. ALL APPLICABLE FEDERAL, STATE AND LOCAL LAWS APPLY. No purchase or payment is necessary to participate in the Giveaway. During the Entry Period, enter the Giveaway by attending the July 22, 2016 premiere of “Guerreiro: The Tiago Lemos Story” at the Center Theatre located at 300 E Ocean Blvd, Long Beach, CA 90802, and staying until the Winner has been selected. One winning ticket will be placed randomly upon the bottom of the theater seats. In no event shall the Sponsor be obligated to award any prizes other than the Prize specified in these Official Rules. The Prize is non-transferable and no substitutions (including, without limitation, for cash) are permitted, except that Sponsor reserves the right to substitute a prize of equal or greater monetary value for the Prize if such Prize should become unavailable for any reason. Each Winner shall be responsible and liable for all federal, state and local taxes on the value of his or her Prize, and any related shipping and handling charges. If due to a printing, production or other error, more Prizes are claimed than are intended to be awarded for any Prize per the above, the intended Prizes will be awarded in a random drawing from among all verified and validated prize claims received. In no event will more than the stated number of Prizes be awarded. THE PRIZE IS AWARDED “AS IS” AND SPONSOR DOES NOT MAKE ANY, AND HEREBY DISCLAIMS ANY AND ALL, REPRESENTATIONS AND WARRANTIES OF ANY KIND REGARDING THE PRIZE(S). One (1) winner (each a “Winner”) will be chosen by the Sponsor at random on or about July 22, 2016 from all eligible entries received during the Entry Period. The number of seats at the premiere determines the odds of winning. In the event of a dispute regarding the identity of a potential winner, the potential winner will be deemed to be the person in whose name the email address supplied in the corresponding entry is registered. NOTWITHSTANDING ANYTHING ELSE HEREIN OR OTHERWISE, GIVEAWAY ENTITIES AND/OR THEIR VENDORS SHALL NOT BE LIABLE OR OBLIGATED WITH RESPECT TO ANY SUBJECT MATTER OF THIS AGREEMENT OR UNDER CONTRACT, NEGLIGENCE, STRICT LIABILITY OR OTHER LEGAL OR EQUITABLE THEORY FOR (A) ANY PERSONAL INJURIES OR SPECIAL, INCIDENTAL, CONSEQUENTIAL, OR EXEMPLARY DAMAGES (INCLUDING, WITHOUT LIMITATION, LOSS OF REVENUE, GOODWILL, OR ANTICIPATED PROFITS), OR (B) ANY MATTER BEYOND SUCH PARTIES’ REASONABLE CONTROL AND/OR ANY MONETARY AMOUNT IN EXCESS OF THE ESTIMATED RETAIL VALUE OF THE PRIZE. To receive a complete list of winners or a copy of the Official Rules, within six (6) months after the end of the Entry Period, send a self-addressed stamped envelope to “Guerreiro: The Tiago Lemos Story” Premiere Skate Deck Giveaway Sweepstakes Winner’s List, Complex Media, Inc., 1271 Avenue of the Americas, 35th Floor, New York, NY 10020.